Accuweigh's Axle Weigh Pads give accurate readings of individual and combined axle weight readings. 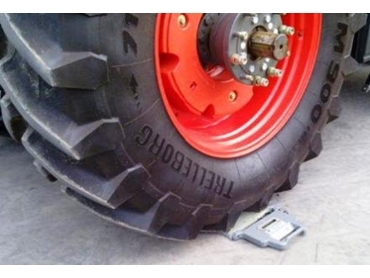 An agricultural company in Victoria has been utilising Accuweigh ’s Axle Weigh Pads to ensure that tractors, when fitted with additional agricultural accessories, do not exceed axle load limits. The low height profile of the self-contained axle weighing scales helps to minimise weighing errors that can occur due to major height differences between vehicle wheels that are on the ground and those in the process of being weighed. The axle weight scales have been designed for easy manoeuvrability and transportation. They each weigh just 15 kilograms and feature a carry handle with integrated weighing electronics and power source of six AA-size batteries. aluminium construction for strength and resistance to corrosion. The axle weighing machines are set to display individual axle weight readings and also come with a setting for displaying combined weights of up to six units at a time. The Axle Weigh Pads can also be expanded to connect up to 16 platforms in one single weighing system. The internal batteries can be recharged using the junction box. Up to six Axle Weigh Pads can be recharged at the same time. Accuweigh has eight branches across Australia including the Melbourne Springvale branch. Accuweigh supplies and offers support for specialist weighing equipment including the Axle Weigh Pads.